1. 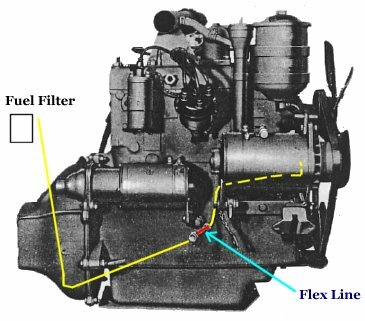 The fuel line routing in this article is the standard for most WWII jeeps. 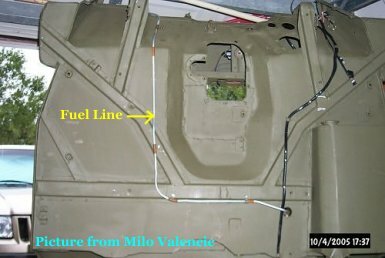 The fuel line routing changed the last couple months of production in June of 45, so this routing fits most WWII jeeps. Because pictures are difficult to take, lets start by looking at some of the TM pictures to get the idea. Here you see how the routing from a top view. 2. 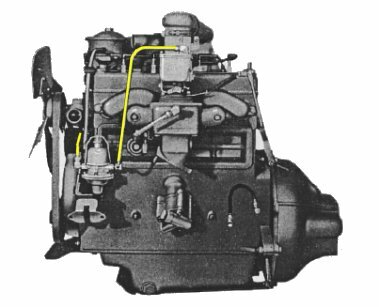 The Fuel Line (shown in yellow) on the driver side, is pretty simple, that is, from the carburetor to the fuel pump. The line then goes from the fuel pump across the front of the engine above the timing chain to the other side. 3. 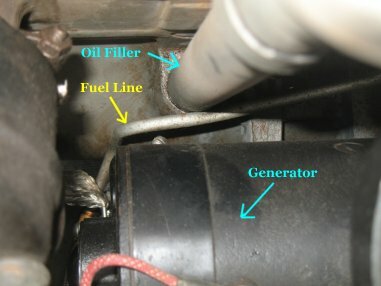 Looking at the line on the other side of the engine, shows the line behind the generator, and then connects to a flex line. 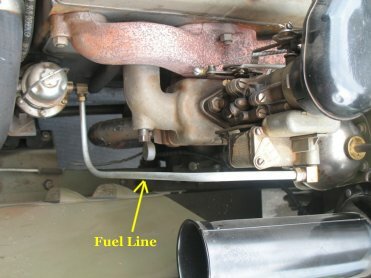 The flex line will connect to a line to the fuel strainer. 4. Now lets look at actual pictures (provided by Robert Lukes!). Starting at the Carburetor and down to the fuel pump. 5. From the fuel pump the fuel line will pass over the timing chain cover. 6. 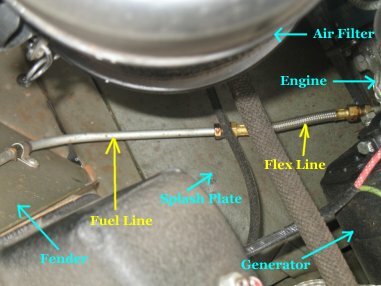 This is a tough picture to see the fuel line, so the items around the fuel line are highlighted. 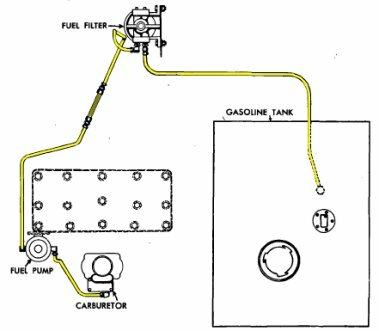 The fuel line will pass over the timing cover and note the material around the tubing is where the fuel line clip will attach to the block. 7. The fuel line will come around the block and oil filler tube behind the generator. The line will drop beneath the backside of the generator. 8. 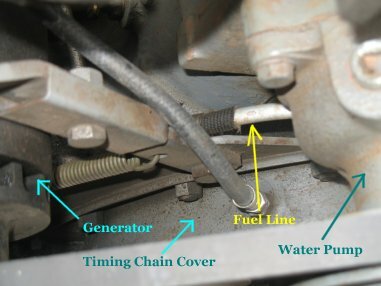 Here you see the line coming from behind the generator, and attached to the flex line and above the splash plate. The line will contine up the passenger fender to the fuel filter. 9. 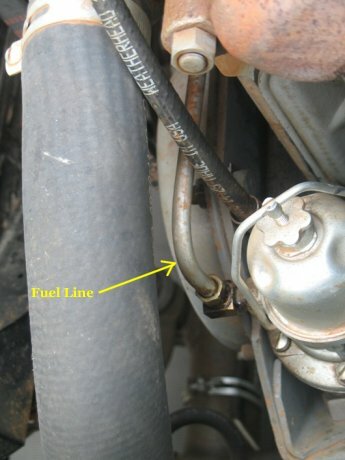 The fuel line comes up the passenger fender (with clip attached) and then ties into the fuel filter. The line will then come out the other fitting on the fuel filter and follow the shape of the tub to the tank. 10. The last picture shows the line routing under the tub and its clip placement on the tub. 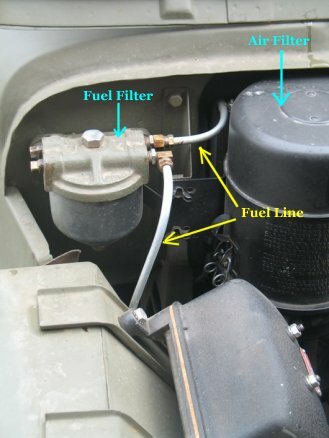 The fuel line will then connect to the tank and your done!